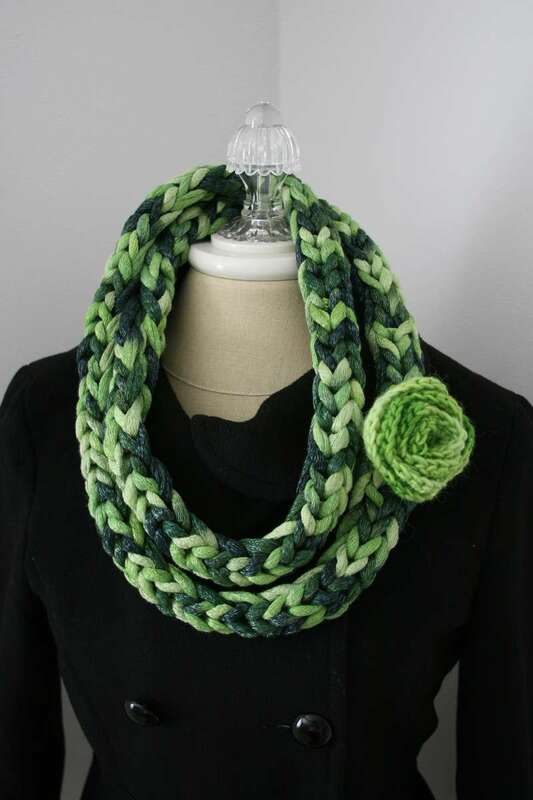 A wonderfully quick project to add an extra touch to your wardrobe. Worked with ruffle style yarn to provide quick thick stitches. Yarn: 1 skein of ruffle style yarn. Sample used Flora Rozetti in Green Meadow (green sample) and Stormy (dark gray sample). Rosette-worsted weight yarn in color of choice and a crochet hook size I. Use three pegs as 1 peg. Cast on 4 sts, prepare to work a flat panel. Row 1: Sl 1, k to the end. Repeat Row 1 until only 10 inches remain of yarn. Join bind off edge to cast on edge by mattress stitch. Leave a 12 inch length of yarn for sewing. Chain 60. Row 1 (Wrong side): Dc 60 across. times, finish off leaving a 5″ length for weaving ends. Thread the tapestry needle with yarn from the beginning end. Roll the rose, petal by petal. Form it with your hands. Once the rose is to your desired specifications, sew the rose securely with the yarn coming from the beginning tail. Sew the rose at the mattress stitch seam point of the necklace. Please explain the m1l increase from 60to80 that is for the slouchy hat on the cover of your all in one book. An answer would be nice! That hat and scarf combo was the reason I bought the book. I know how to do the m1l just not from 60to80. Please e-mail me back! http://blog.knittingboard.com/index.php/archives/2083 Check out this link, it provides two ways of achieving the increase. The Iva Headband is a double knit design, that widens as the knitting progresses to keep wind away from the ears thus keeping the wearer warm. The pattern uses simple decreases and increases. 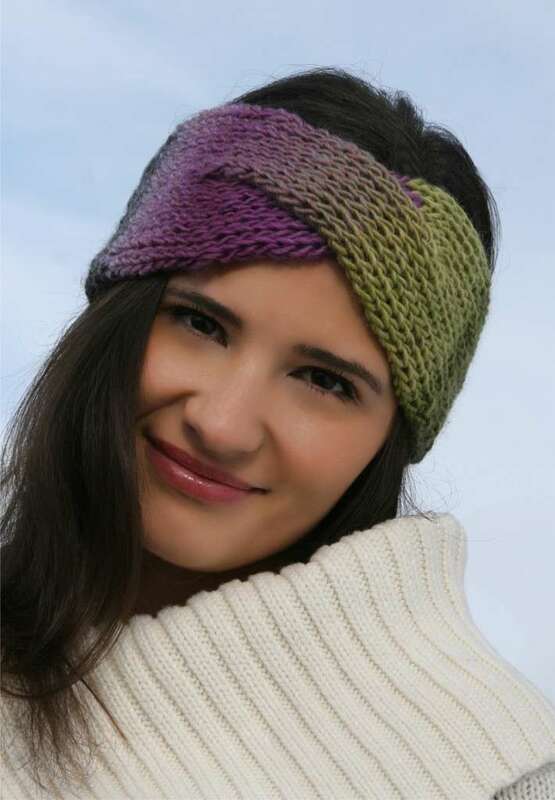 Use a super soft merino yarn and complete the perfect winter headband! Knitting loom: Basic Loom Knitting Kit Loom, (Oval small loom with 32 pegs.) 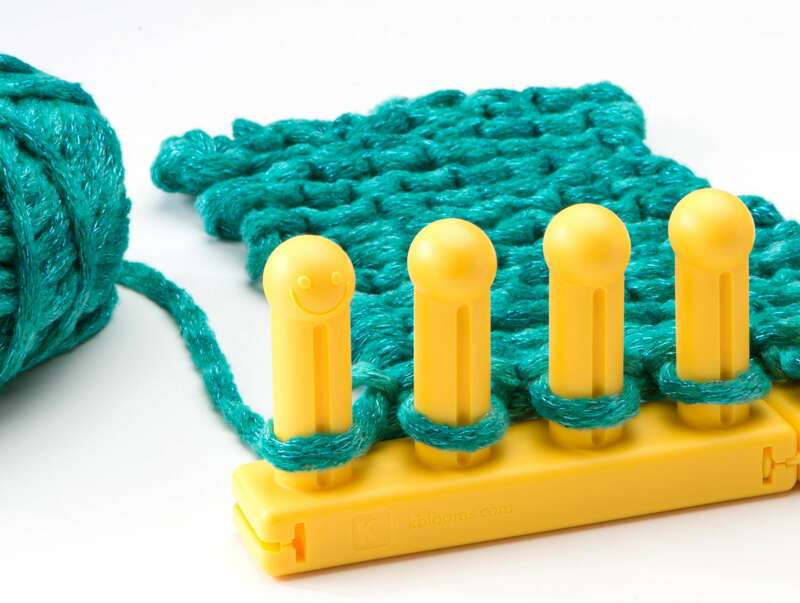 Any of the other KB knitting looms set to a knitting board can be used for this pattern. Pattern notes: Please follow the links to see diagrams on the special techniques used in this pattern. The headband is worked in double knit, using the stockinette stitch. Increases are used at the beginning of the headband to widen it, then decreases are used to make it less wide. Using the Figure 8 cast on 4 sts. *Work 4 rows in stockinette stitch. Work 10 rows in stockinette stitch. Divide the board in half, 7 sets of sts on each side. Side A and Side B. You will work on half of the board at a time, Side A first then Side B. On the side with the working yarn, work 14 rows in stockinette stitch. Removal 1: Using the two pieces of scrap yarn and tapestry needle, carefully, remove the first seven 7 sts from one side and leave them on the piece of scrap yarn. 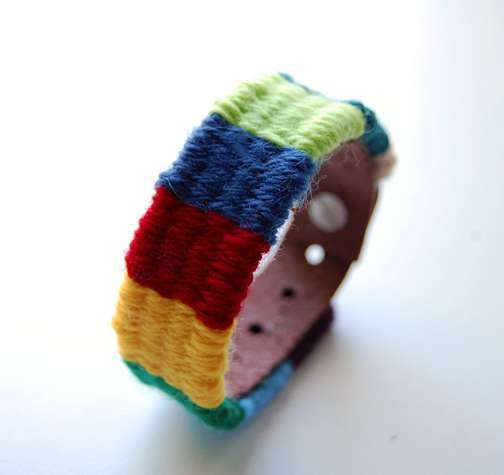 Remove the 7 sts from the opposite side to a second piece of scrap yarn. Cut working yarn and join to Side B. Work 14 rows in stockinette stitch. (Headband will look like picture 1 below). Without twisting the stitches, simply slide all the stitches from Side A to Side B (see picture 4 below). Place stitches from side B on the pegs emptied at Removal 1. Place the stitches from side A, onto pegs emptied by Side B at removal 2. All 14 sts are back on the knitting loom. Rep from * to * until 4 sts remain on the loom. Option 1: Simply overlap the cast on edge over bind off edge and sew in place. Add a button for decoration purposes. Option 2: Crochet a 1 inch chain at the bind off edge. Attach a button about an inch from the cast on edge. 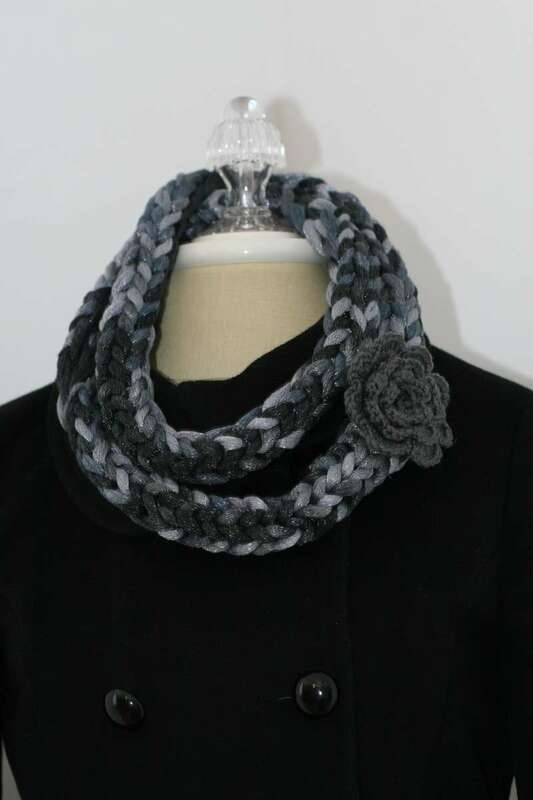 Use the crochet chain as a button loop. This will work on aio? So glad to see a double knit pattern for my original knittingboards. Thanks. Looks great. Love this project! Thanks for sharing it with for free! Yes. Put the small spacers in instead of the sliders and it should work. I have now made the headband on the All’n’One and the Tadpole and both came out just great! So any board will do. Would this work on a knifty knitter loom? Is their a way of doing on your straight knitting needles ? I don’t understand the loom knit. Thanks. I cant figure out the loom. Do you have insructions for just straight needles? We don’t. I only have the instructions for the knitting loom. You can start with 8 stitches as opposed to 4 and this should make the headband shorter. Hello Isela, I made two headbands are they came out huge. Can you please tell me what I’m doing wrong? I used the MS loom with the 14 blue pegs. Thanks love your work!!! The gauge of your loom is too large. Set the two sides closer together. I love this pattern but, was wondering how you would break this down for a smaller child? I made this headband twice. The first one was too large. I gathered the back of the band (after remeasured the recipent’s head) and made a little bow attached the button in the center of the bow. My daughter loves it! The second one was still too big…so I over lapped the back added the button on the top! I must say it turned out very cute too. Lesson learned? Still not sure how to make it smaller. I used the purple board from knifty knitter looms. I am guessing the pegs are too far apart. Way to small on aio I read on another page if I increase the 10 stocknet to 18-20 it should work is that in both places in the pattern? Thx I want to make me one after all the presents are made. 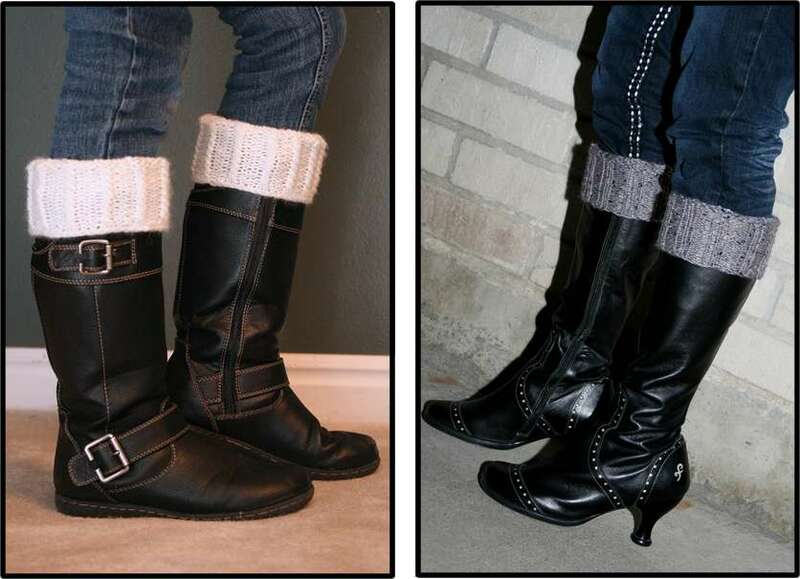 Boot cuffs or boot toppers, however, you want to call them, they are super popular right now. You can make your very own with your knitting looms. We give you two examples here, same pattern, two different looks. I will give 3 different sizes, follow the one that best fits the top of your calf. Yarn: Approx 100 yards of yarn needed for a pair. Cable sample used Knit Picks Chroma worsted, Ribbed example shown in City Tweed Aran. Pattern notes: Three sizes provided, S, M, L to fit the following top calf measurements 14 (16, 18). 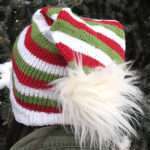 The knit stitch was used in the samples, using the e-wrap stitch will provide a much larger item. The ribbing allows for the boot cuff to stretch nicely over the boot. Special note should be taken with cotton yarns as this type of yarn doesn’t have any inherent elasticity. It is imperative to bind off loosely. TW=Twist for the mock cable. 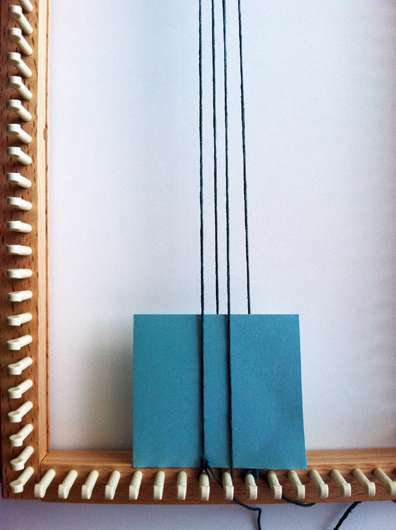 Over 2 pegs–skip peg 1 with yarn behind the peg. Knit peg 2. Remove stitch from peg 2 and hold it. Knit stitch from peg 1. Move stitch from peg 1 to peg 2. Place stitch that you are holding on peg 1. Using the ewrap method cast on 48 (52, 56). Rnds 1-24 (1-26, 1-28): *k2, p2; rep from * to end of rnd. Rep from ** to **: 11 (12, 13) more times (for a total of 24 (26, 28 rounds ). You can wear the boot cuffs with the ribbing on the outside or the cables towards the outside. I’m new to this. Would it be possible to post YouTube videos to your channel for posted projects also. It would be helpful. 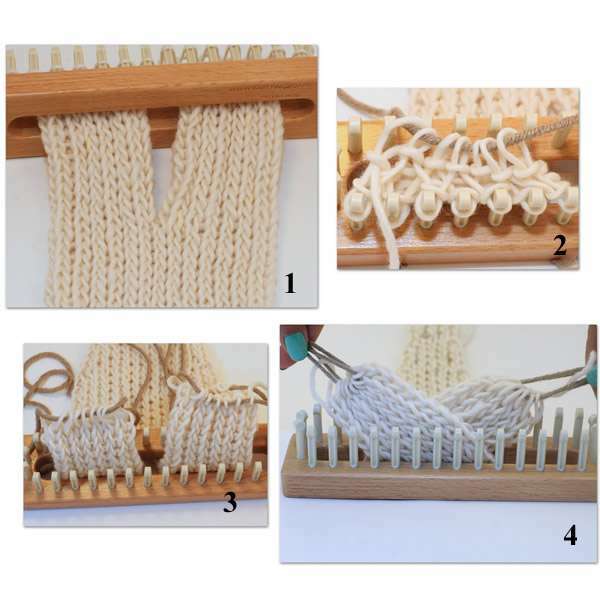 Have you tried weaving on your knitting board? Weaving is an ancient technique dating back 27,000 years, but with very contemporary possibilities. 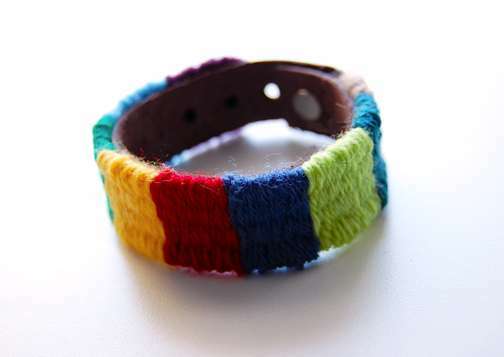 This tapestry woven bracelet is a quick afternoon project and a great way to use up those bits of yarn you have buried at the bottom of your yarn basket. I think of it as a grown-up version of the friendship bracelet, though if you have a teenager in the house, I’m sure they will want one too. Warp – the vertical lines of yarn you weave in an out of on the loom. Weft – the horizontal line of yarn that you weave in and out of the warp. 1. Add the loom extenders. Place one extender at one end of the loom and add the second in the middle hole of the board. 2. Warp up the loom Tie the hemp cord to a peg toward the middle of one of the extenders. Run the cord to the peg exactly opposite on the other extender. Continue until you have 4 lines of warp. Tie the hemp cord to the last peg you’ve warped and cut leaving a 5″ tail. 3. Begin weaving. Weave in your piece of cardstock. Weave over the first warp thread and under the next. Continue in this same pattern until you reach the last thread. The cardstock acts as a header and will provide you the space you need later to be able to weave in the warp threads as you finish off the project. Now, Thread your tapestry needle with your first color of yarn. Weave under the first warp thread and over the next. Continue weaving until you reach the last warp thread. Pull until you have a 3″ tail. Weave the tail into the middle of the warp. Leave it dangling off of the back. You will weave it in later when you finish off the project. Continue weaving. Rows will alternate between starting with an over or an under. Use the fork to push the weft down and up against the card as you proceed. The fabric will become dense and only the weft will show. The warp of hemp cord will become completely covered. 4. Switch colors. Weave in the last bit of the first color leaving a 3″ or so tail. If you finished on the right side, begin your next color on the left and vice versa. Why? The tail builds up the edges a bit faster. 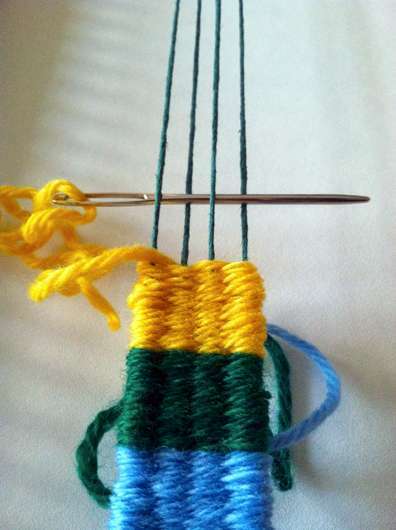 By ending one color on one side and starting the new color on the other side, you will even out these “bumps” and your weaving will look smoother. Repeat this process every time you switch colors. You will end with a one inch wide piece of weaving that is 7″ long. 5. Taking it off of the loom. With your knitting tool, lift the warp off of the pegs. Untie the knots you may have made at the beginning. Gently remove the cardstock. Cut the warp threads even leaving approximately a length of 2″-4″. Thread the tapestry needle with one warp thread and run it into the groove / space of the warp thread next to it. Push it through this space for about an inch. Pull it out to the back and clip the remaining tail. Proceed in this manner moving left to right. With the last warp thread, run it into the groove of the warp to the left. This will be a bit trickier only because there are already two warp threads in that space. Once you have finished off all the warp threads, proceed with to do the same with the weft tails. 6. Glue the weaving to the leather cuff. Add a thin layer of the leather glue to the cuff that is the length of your fabric. Press the back side of the weaving into the glue. Allow to dry thoroughly. Loom: Small gauge knitting loom with 11 pegs. Notions: knitting tool, crochet hook, ½ inch button. Rep from * to * until item measures 17 inches long from cast on edge. With crochet hook, use tail from bind-off edge to work single crochet along bind-off edge as follows: work along first ½ inch of edge, chain 8; reattach crochet along edge and work single crochet to the end. Break yarn and draw through last stitch, pull tight. Sew a button to the cast on edge of headband, opposite buttonhole. Weave ends in and block lightly. Check out the video demonstrating the 3 lace rows (row 5, 7, and 9). Wow thank you I can’t wait to do this. I love the pattern and have learned a lot by following along with the video and the written part. I only made a sample with a larger gauge but will make a finer gauge for a thinner head band. Thank you for sharing and teaching the craft. S pretty! Nice color and very feminine – thanks for sharing! I love your videos you are amazing I just have a small request if possible. I am knew at this and I don’t know hire to read patterns can you make a video and show us his to read patterns please? Sorry for the previous comment I hate auto correct but you get what I’m saying right? Isela you are awesome. I came very late to the looming party, Christmas of 2012,after buying my daughter the boye circular loom set. I loomed my first hat and have been enjoying it ever since. Being a visual learner your videos are priceless. I know you’ve backed off of your all consuming work in loom knitting but I’m so happy to see you continuing to share patterns and videos. Thank you for sharing your knowledge. I’ve made 2 Iva headbands, the second one i did in 2 colors it turned out great. I’ve been looking at this pattern from time to time,and I think I’m ready to tackle it. I would love to see the one with 2 colors! I bet it is stunning. 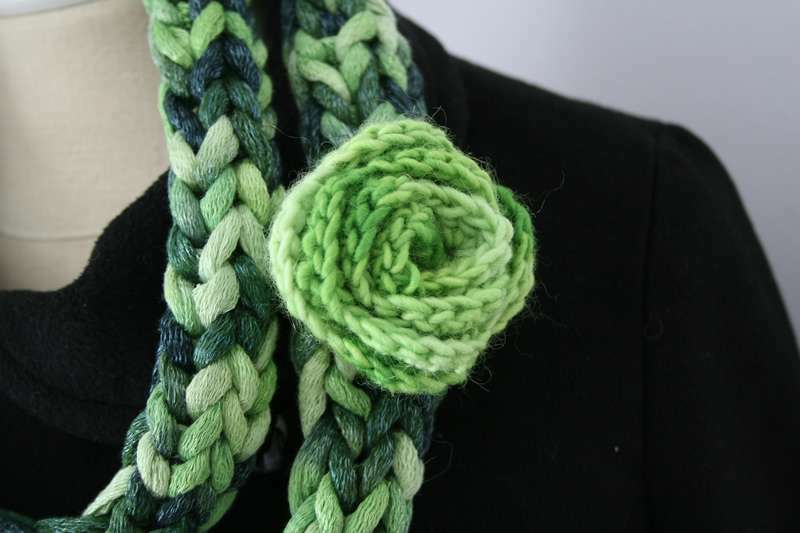 Have you attempted making a knot with the overlapping fabric? I bet it would look great like that too. Good luck with the Cat’s Paw Headband, it is a cute one :). I appreciate you response to my post. The knot interesting idea, how much longer do you think the separate rows of seven would have to be to knot and still be able to reattach to the loom ? Probably about 20 rows of the 7 stitches, I think you can take it off the knitting loom and knot it and see if it is long enough and then place the stitches back on the loom. A very educational video. I too am a visual learner when it comes to knitting. This is one of the best videos I have seen. We heard the cold weather is getting to you and you need something to cheer you up. We put our thinking caps on and we decided to spice up the month of March with a contest. 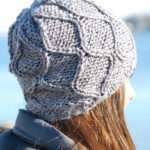 Have you seen our latest pattern? The cute headband? Well, if you haven’t, this is your chance to get your looms out, dust them and get ready to work. I have put together the pattern in a PDF file for you and here is the complete link to the video playlist. 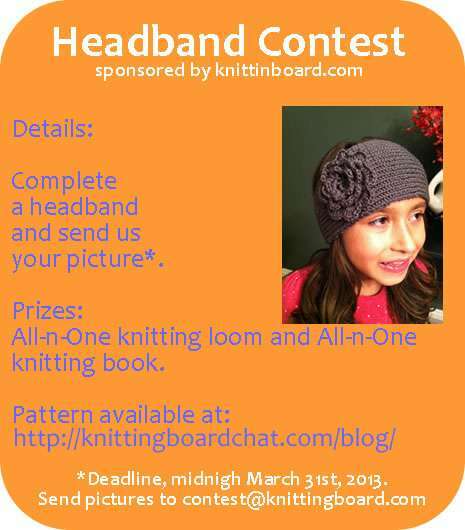 First Place: One All-n-One Knitting Loom and All-n-One Loom Knitting Pattern book. First Place winner: it will be chosen by the following criteria-colors used, photography setting, photography ingenuity. Second and Third places: we will give all entries a number, except the First Place winner’s entry. We will place them in the random number generator and allow the winners to be chosen randomly. You can enter multiple times. Do we have to use the flower to embellish it or can we use anything we like? I send in some pictures. I’m seeking for a skilled writer, extended time within this region. Superb write-up! The entire playlist has been uploaded and is ready for you. Enjoy! Welcome my loomy knitters! It is February! Snow still coming down here in Utah…sigh, and we are feeling like penguins and walking like some too, hahaha. Loom: All-n-One Loom Single knit with 33 pegs. Yarn: Approx 100 yards of worsted weight yarn in color of choice. Worsted Weight yarn. Sample was worked with Cascade 220 Superwash Wool in Gray. Notions: knitting tool, measuring tape. Note: Pattern by Tiffany Matthews. Converted to loom knitting by Isela Phelps with permission from Tiffany Matthews. Row 1 (Going from right to left on your knitting loom): k1, *p1, k1; rep from * to end of row. Row 2 (Go from left to right on the loom): k1, *p1, k1; rep from * to end of row. Row 8: Work in the rib pattern across all the stitches, knit the knit stitches, purl the purl stitches. Continue to increase in this manner until your work measures 7” from the cast on edge. You should have 33 stitches on the needle. Continue to decrease in this manner—every other row that goes from right to left, k3tog or p3tog the two very center stitches, with the rest of the stitches being worked in rib stitch (knitting the knits purling the purls)–until you have 9 stitches remaining on the loom. Last 4 rows: work in rib stitch as established. Remove from the loom using the Basic Bind Off method leave the last stitch on the peg. Transfer the last stitch to a crochet hook. Chain 4-6 stitches and connect them to the beginning of the BO edge (this makes the button loop so size it according to the size of your button). *You may continue doing a decorative crochet edging. Single crochet around the entire headband edge. The entire crochet border is optional. It gives the edge a bit of a decorative look. But the headband looks fine without it. If you choose not to do it. To make the headband wider, cast on extra stitches. To make it longer, add extra rows at the center. LAL videos coming right up-3 videos just for you. This is beautiful – is the flower crocheted? Yes, the flower is crochet. I love all your patterns. Do you have any adult women skirt or dress patterns? I’ve been searching for knitting boards and looms and can’t find any. I’ve found some for regular knitting, but I don’t know how to transfer that pattern for a loom or knitting board. Any advice would be helpful. Thank you! Would you mind explaining kf&b and m1b please? Also pfb and m1f. If I get that far, I should be able to work the rest out. Thanks. I used the All-n-One loom. We have videos that demonstrate the kf&b, p2tog, and k2tog. The videos are here on the blog. K, I just had a huge mess both times I tried this. I’m new with a loom (and knitting for that matter). My increases only went to the right but in your video it looks like your went both ways from the middle. The stitches on the right look OK but the ones to the left of center were all messed up, they were just straight across stitches, I’m so confused. I’d really like to learn this, can you offer any help? 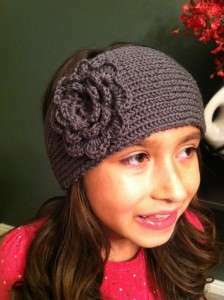 Love headband pattern and the video is the greatest help. Thank you. Yes, this can be done on any knitting loom. The pattern is worked as a flat panel, knitting back and forth in rows. Not meaning to be rude by any means. However, are us loomers a bunch of whimps? I have wasted waaaaaay more time then should have been necessary to find adult dresses. I am a very brave new looked who love to have some options for spring. My daughter thinks I should be able to do anything. Frankly, I am starting to think I need to find pieces of patterns (a cape, T-shirt or sweater) connected to a piece of an afghan, for instance, to come up with something. Of course a dress may come in panels but does a beginner have to be an inventor while they learn? I know it’ s not your fault I am just frustrated. If you know of any sites please send them my way. Hello!! Love love love, this pattern. But would you by any chance have a pattern for the flower, or at least the name of it?? Thanks a million for sharing this! The flower is a pattern I got from YouTube. I don’t remember the name of the pattern but it is all crochet. The only foloom i have is a 31 peg. I want to k1p1, but what do i do with the 31st peg. You will just do a k1 on that peg. Do you want it to be completely ribbed–k1, p1 all throughout, and have small ribs throughout, if you do, you will just have 2 knits together (the 31st peg and the 1st). 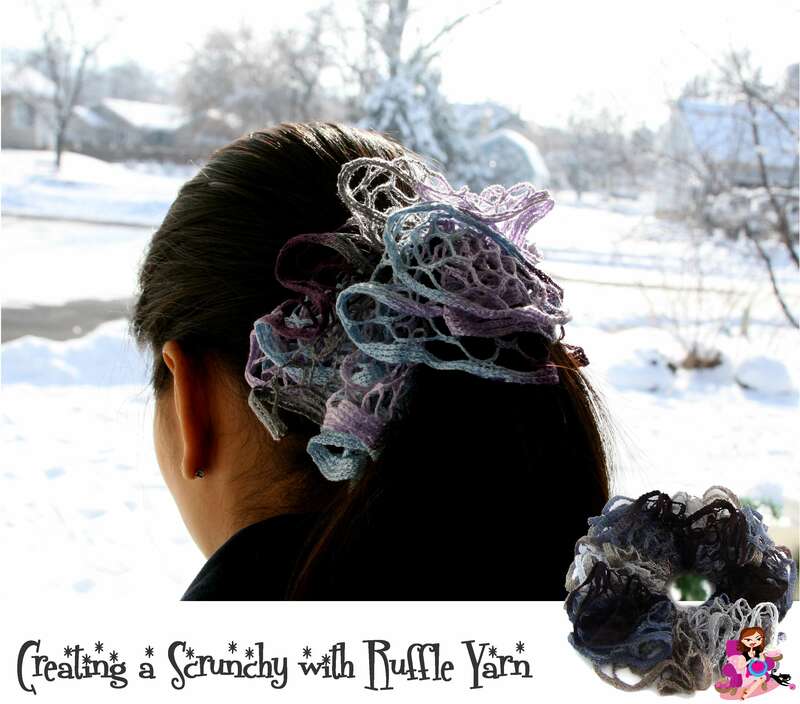 Chances are you have a bit of left over yarns from all the ruffles scarves and you probably don’t know what to do with all of them. Here is a new little “item” that you can create. It is not on a loom, but I promise you, it is not hard at all. If I can do it, you can too and I already created 2 of them :). I created a video on how to go about the small project. Enjoy! Can anyone HELP ME? I am lefthanded and I am having trouble even getting started. In fact I have started every other day or so since Christmas and I am still not past 2 rows! PLEASE HELP ME! Excellent video~~ this is a perfect accessory for my granddaughter! She loves the ruffled yarns and I don’t like to make her a scarf with the entire skein because it’s too long on her. She loves hair scrunchies!!! I am left-handed – there are videos on YouTube for lefties!! During one of our weekend gateways, I spotted a leather bracelet with a single rosette as the focal point. The rosette bracelet is my attempt at recreating my heart’s desire. Loom: 10 peg small gauge loom. All-n-One loom by Knittingboard.com was used in sample. Yarn: 40 yards of worsted weight untreated wool for the flower. Knit Picks Wool of the Andes worsted weight in Fairy Tale (1/3 skeins) was used in sample. 20 yards of worsted weight pima cotton for the bracelet. Knit Picks Comfy Worsted was used in sample in Honey Dew (1/8 skein). Gauge: 9 sts x 10 rows= 2 inches. Stitches: knit stitch (k), knit into the front and back of the stitch (k1f&b), knit 2 together (k2tog). Rosette Bracelet shows 2 large flowers and a small flower. Using CC, CCO 8 sts. Rep Rows 1 and 2: 14 times (or until desired length is achieved). Sew two small buttons on the CO edge, approx 2 rows in from the edge, making sure they line up with the eyelets on the BO edge. Note: Small Petal and Large petal form the flower shape. Follow all instructions to create the large flowers. Follow Small Petal instructions to create the small flower. [Rep Rows 1-6]3x. If making Large flower, do not break yarn and continue with Large petal instructions. If making Small Flower, stop here, break yarn and go to Assembly. Break yarn, leaving a 20 inch yarn tail. Thread tapestry needle through the yarn tail. Use a running stitch along the straight edge of the long panel. Pull on the yarn tail to gather and form the knitted fabric into a flower shape. Tie the yarn tails together, knot to secure in place. Weave ends in. Felt the Flowers. See side panel for Felting Instructions. When flowers have been felted, stack them up, two large flowers on the bottom, then the smallest at the top. Thread tapestry needle with MC and using one of the buttons, sew all three flowers together at the center. Tightly secure the button to the flowers. Cut yarn leaving a 10 inch tail. Use yarn tail to securely sew the flowers to the center of the bracelet.